While living in Paris several years ago, I was offered work in Spain. 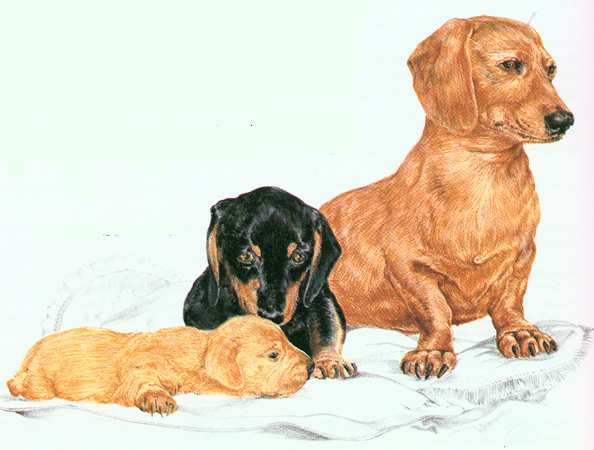 I needed the job, but my female dachshund was in the last stages of pregnancy. Traveling seemed foolhardy at such a time, yet I couldn't leave her behind. A train was out of the question although dogs were allowed to sit with their masters in first-class compartments as long as they were issued half of a second-class ticket per pooch. The rocking motion made her nervous, which meant she peed in the wrong places. Riding in automobiles, however, was her great delight, so I rented a Citröen station wagon and made a cozy nest for her and her mate in the back. The vet assured me she wouldn't whelp until we were in Madrid. Away we drove in late December. I took my time, stopping to walk the dogs, dine at cafes, and spend the nights at inns along the way. It was cold, but bright and sunny, when we reached the Pyrenees Mountains separating France from Spain. No storms were predicted, so we headed into the heights of the Basque country. But the cheerful morning weather report notwithstanding, the sun disappeared behind heavy clouds at two o'clock that afternoon. It started to snow. The snow rained down so heavily that I could barely see to drive, but there was no place to stop, neither a gas station nor an inn. When darkness fell at four o'clock, the curving road was rendered almost invisible. On one side stood dense forest, on the other lay a narrow shoulder and a thousand-foot drop straight down--without guard posts or railings. Not until that moment did it occur to me that this was a crazy way to spend Christmas Eve. An image of the Holy Family crossed my mind. I saw Mary on a donkey and Joseph by her side--guided by a star. Boy, I thought, could I use one of those! Suddenly, there it was: MY star--the red taillight of a huge truck on the road ahead. I could only perceive it dimly through the blizzard which was blowing in upon us. An added handicap was the yellow headlamps on my rented French car, by whose pale light I could scarcely see a thing. Still, we might be home free if the truck stayed our course. A premature sense of relief vanished when an unmistakable squeal issued from the rear. The mother-to-be was about to prove that the Parisian vet didn't know Madrid from the Pyrenees when he had assured me she would not give birth till we drove along the Gran Via in the center of town! She was in labor NOW. The squeal gave way to anguished howls quickly picked up by her sympathetic mate. As if the canine Christmas caroling weren't enough, the taillight of the truck mysteriously disappeared. Had the vehicle turned off the road to the left, or--I felt a certain stricture in my breast--had it FALLEN off the road to the right? In panic, I committed the folly all slippery-road drivers are warned against; I hit the brakes--and skidded off the road to the left, thank heaven, away from the cliff's edge. Shaken, but unhurt, I grabbed the flashlight and jumped out to look for the truck. I couldn't see the asphalt because of snow cover, just the wide tracks the semi's huge wheels had carved through the drifts. Thirty or forty yards later, I found the truck leaning at an angle, twisted rightward across the road. Making my way cautiously around it, I was halted by a command shouted in French, "Stop, or you will walk off the cliff!" A light shone from above. I looked up to see a glowing figure on the roof of the cab and thought of the heralding angels who spoke to shepherds in the fields, but it turned out to be the trucker swinging a lantern from side to side as he checked the situation. "One wheel is hanging over the edge, but my truck will not go down," he declared with some relief, then slipped and tumbled into a drift. He came up snorting: "I'm the best driver there is! I don't understand why this has happened to me!" "On a night like this, we're all at the mercy of the elements," I tried to comfort him. "I'm also off the road, and I've got a dachshund having puppies in my station wagon!" His face brightened. "That's it! I studied to become a veterinarian till I found out there was more money in trucking. It took the hand of God to force ME off the road, I tell you! Yes, He's put me here for a reason! When we reached the Citröen, my dog was engaged in a frantic struggle to deliver her first litter. Our new friend took over, remaining with us through the night. She had a tough time of it, but when the blizzard subsided and the sun came up, she was the proud mother of five healthy pups--females every one. "No more coming," the young Basque announced, crawling out to wash his hands in the snow. Warmed by sunbeams glancing gaily off icicles hanging from the trees, the morning was as pretty a Christmas as I ever saw. "Wait!" the trucker cried, perking up his ears. He rushed back to the car and leaned again over the tired little mother. "I was wrong." A last pup slipped out--the only male, and the runt at that! "Unto us a son is born,"said the driver, lifting it high. As for me, I offered up a silent prayer of thanksgiving not only for the guiding "star" of the truck's taillight, but also for this "angel" who believed himself placed in our path by God. So did I.